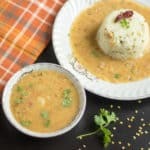 It is really fascinating that how all these Indian cuisines have their unique and authentic dal recipes. I am super glad about picking this Indian Legumes theme and all these new dal recipes have now become the staples in our household. Earlier this year I posted the Bengali cholar dal, and now it’s the Sobji dal. The yellow lentils or the split moong dal is one of the most commonly used lentils in India. 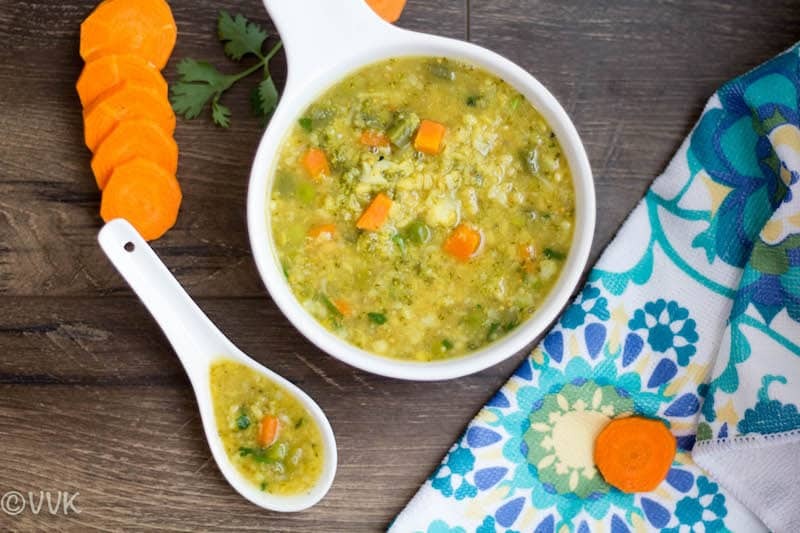 One cup of cooked moong dal approximately has 7 to 8 gram of protein. With veggies added and when served with roti or rice, they form a complete meal. 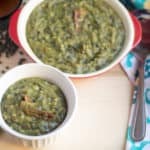 There are different methods and variations to prepare this dal, but here is my instant pot version. You can use mustard oil or ghee for tempering. We are yet to acquire the taste of mustard oil, so I went with the regular cooking oil. Traditionally winter vegetables are used for this recipe. 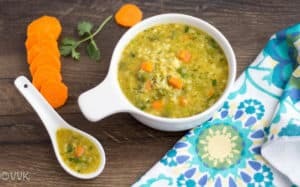 I used beans, peas, carrot, cauliflower, and broccoli for this recipe but you can use any veggies of your choice. Here is the recap from previous marathons and the sobji dal recipe. 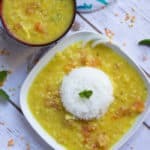 Instant Pot Sobji Dal / Sobji Diye Bhaja Muger Dal is a Bengali style dal recipe prepared with roasted moong dal and mixed vegetables in Instant Pot. Chop all the veggies and wash them. Drain the water and set aside. Chop the green chili and ginger into small pieces and set aside. Set the instant pot in saute mode and add 1/2 Tsp of oil. Then add the 1/2 cup of moong dal and roast them until they turn light brown or until you can smell the nutty aroma. Turn off the IP and remove the moong dal and soak in water. Set the IP back in saute mode and add the remaining 1.5 tsps of oil. Once the oil is hot, add the panch phoron, chopped green chili, and ginger and saute for a minute. Then add the chopped vegetables, turmeric powder, garam masala, sugar, and salt. Mix them thoroughly. Meanwhile, drain the water from the moong dal and add it to the veggie mix. Add 2 cups of water and close the IP with the vent sealed. Let it cook in manual mode for 5 minutes. After it beeps, wait for 5 minutes and release the pressure quickly. Carefully open the lid and mix the dal nicely. Set the IP back to saute mode. Finally, add the chopped cilantro and let it simmer for 3 minutes. That’s it. Sobji dal is ready. Serve it hot with rice or roti. Heat a kadai or pressure pan and add 1/2 Tsp of oil. Turn off the heat and remove the moong dal and soak in water. Heat a pressure pan/cooker and add the remaining 1.5 tsps of oil. Add 2 cups of water and pressure cook for up to 2 whistles. Once the pressure is off, carefully open the pressure cooker lid and mix the dal nicely. Add chopped cilantro and simmer the dal again over low flame for 3 minutes. 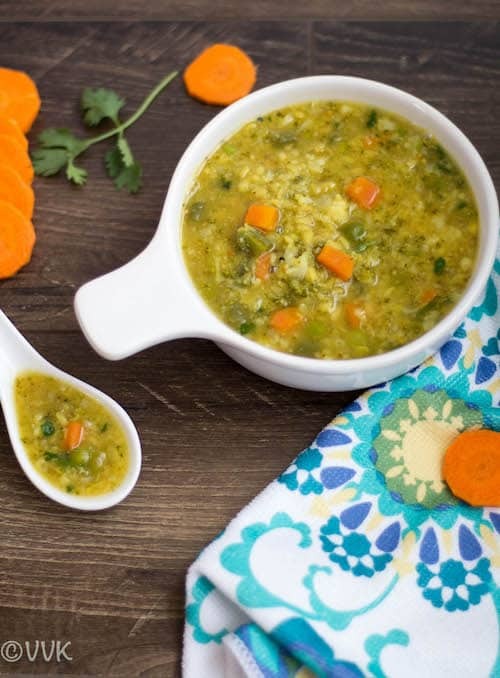 Traditionally winter/seasonal veggies are used for this recipe. You can mix and match with your favorite and available ones. 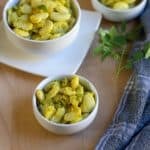 Roasting the moong dal adds a delicate flavor to this recipe but if time is pressure you can skip the roasting step and add the washed dal directly and cook it along with veggies. Instead of oil, you can use ghee for tempering. You can add onion and garlic during tempering for more flavor. Shut down the IP and remove the moong dal and soak in water. :-) Thanks Ruchi. Glad you liked it. Yes Kalyani from 26 states. :-) I use both IP and Pressure cooked in tangent. Thanks a lot. 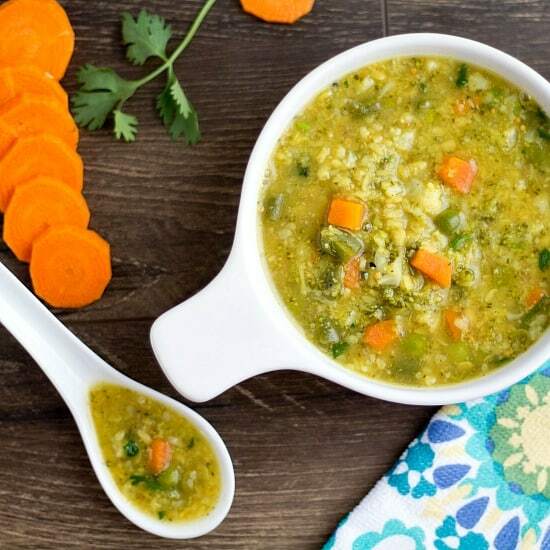 Dhal with veggies are even more healthier and makes the meal so filling..
Dal with veggies is a always good option for lunch, it’s a good way to feed a lot of veggies to the family. Thanks Rajani. I love the dal for the very same reason. Being in this wonderful group has introduced me to so many different kinds of cuisine. 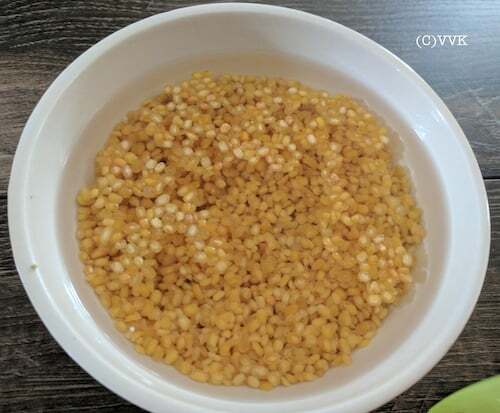 I usually make moong dal as a curry or use it in khichdis. Like your preparation with vegetables. One more variation added to my list. Oh yeah… there are zillion variations to any given dal. Thanks a lot Mayuri. Love the one pot meal… pulses, vegetables and spices. Great combination and healhty too. 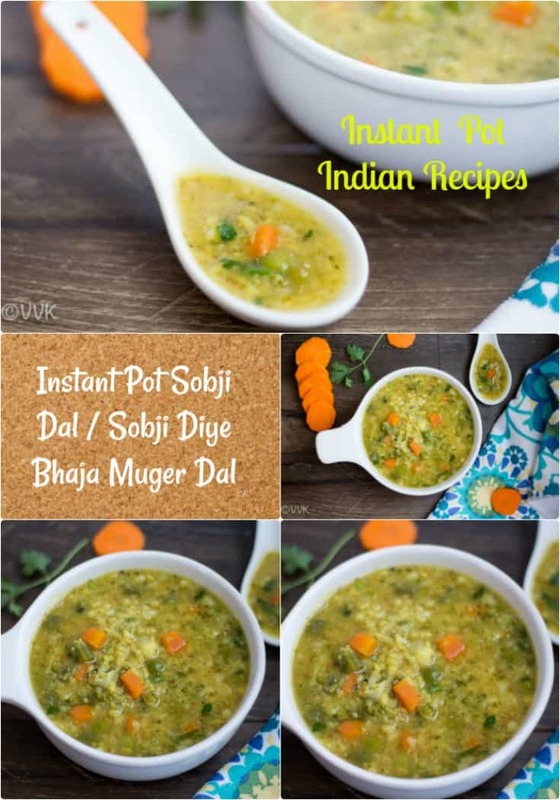 Looks like instant pot makes your cooking easy, can see many delightful dishes from you with instant pot, well done Vidhya. Coming to this sobji dal, what a beautiful and complete meal with many nutrients in it. Thanks a lot Priya. Yes IP makes cooking super easy. I love Bengali Cuisine and want to make a complete platter, this sobji dal sounds fabulous. bookmarking. With all the additional veggies, this is one delicious dal. 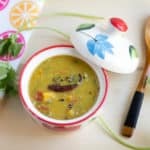 Looks so inviting..
Nice dal recipe Vidhya. Feel like grabbing a bowl and finishing it off as such! It’s nice and easy to make everyday curries in IP? right? The dal and veggies combo looks healthy and inviting. Oh yeah very true. Thanks Sapana. Awesome Srividhya, so interesting to get dals from different states, what a wonderful theme and to make them all no onion, excellent! Thanks Valli. Not all are no onion no garlic. But tried my level best. This dal looks delicious. Would be perfect for comfort food with a bowl of rice.